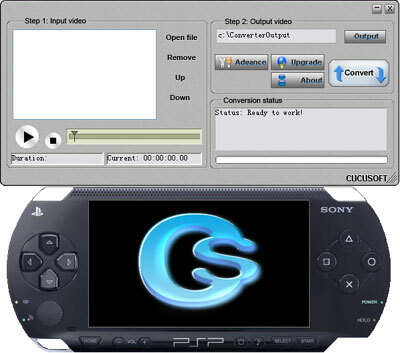 Cucusoft PSP Video Converter is the simplest and fastest Sony PSP Movie and PSP Video conversion tool. It can convert almost all video format, like DivX, XviD, MOV, rm, rmvb, MPEG, VOB, DVD, WMV, AVI to PSP Movie / PSP Video format and it does the conversion directly to PSP compatible video format. Also, the converted PSP movie/video supports PSP screen which allows you to enjoy your favorite movie on your PSP as a MPEG-4 Player. The best part is, you can get this PSP video converter at a very reasonable price! 1. Updated default audio sample rate from 64KHz to 96KHz. 2. Fixed a minor bug on opening advanced settings dialog. --Offers an excellent customer support that will always be eager to assist you. You may email your inquiries at support@cucusoft.com. Supports any video file that can be played on Windows Media Player properly.